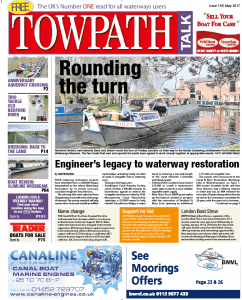 Don’t miss the May issue of Towpath Talk as it’s full of super show news – including a four-page Crick wraparound so you can find out what’s going to be happening at this popular waterways show. 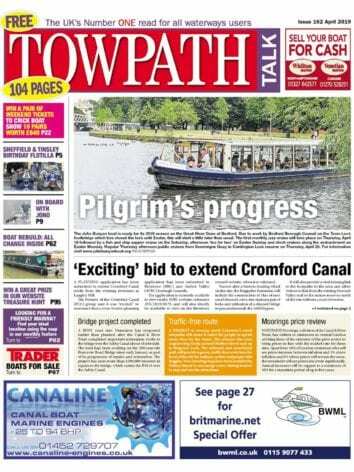 As usual we’ll be keeping you up to date with the latest news from the UK’s canals, towpaths, volunteer work parties and waterway organisations and May’s 116-page publication is packed with colour photographs of joyful days out, holiday ideas, show suggestions and topical issues covering a host of boating subjects. There’s latest news from around the network including a major legacy for restoration projects, a threat to a Scottish lowland holiday fleet and an update on the IWA’s monitoring of Anglian waterways. Event reports include the anniversary canoe crossing of Edstone Aqueduct; news of an intrepid trio navigating Old Bedford River; and the Russell Newbery Register presentation. 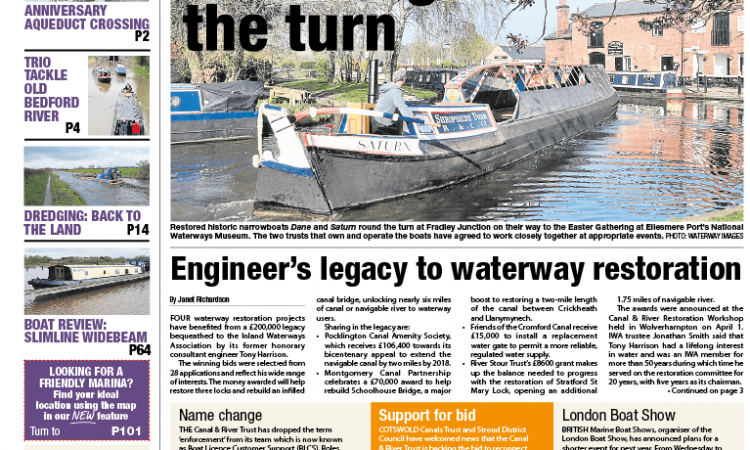 The RYA takes a look at boating on the continent, the IWA’s work parties dredge some unusual items from canals and, for those who like to see diggers in action, there’s a feature dedicated to dredging! Community boating news includes skipper training with the Ethel Trust, Rivertime dream, Have-a-Go cruises and a record year for Pocklington trip boat. In business news, we focus on the completion of work at Leicester Marina, the sale of Whixall Marina, Windermere Quays expansion and Mercia Piazza development. A slimline widebeam from Narrowboats Ltd offers an unusual boat review this month as buyers seek a spacious craft that they can comfortably spend lots of time on but still moor, take through locks and navigate the waterways with relative ease. Our round-up of upcoming events includes Beale Park Boat Show, Rickmansworth Festival, South Pennine Boat Club regatta, Coombeswood open weekend, Wey river rally, Braunston Historic Rally preview and a host of fun-packed May listings. Ben Sutcliffe-Davies looks at overboard discharges in his technical and services column, and we turn our heads to the heavens to check out the Great Bear, one of the most recognisable and visible constellations in the night sky. And if that’s not enough, we’ve got a host of new products and publications – a Castrol Oil reader offer, various uses for Sugru mouldable glue and our latest book round-up. Alison Alderton’s bi-monthly round-up On Irish Waters includes a poignant feature on the canal escape route during the Irish famine, the Offaly St Patrick’s Day parade, Head of the River winners, Royal Canal bicentenary and engineers’ week. Little Venice in London is the latest Treasure to be unearthed by Phillippa Greenwood and Martine O’Callaghan, while Helen Gazeley looks at the threat to the environment from the disposal of wet wipes in her Wet Web column. Last word, as ever, goes to boat horse Cracker who meets more cut characters, and there’s a free heritage trips update straight from the horse’ s mouth as well as an evocative image of Gloucester Dock in its heyday. NABO vice-chairman Mark Tizard discusses the role of voluntary lock keepers and there are letters from readers about waterway-related issues.